Wow. Two rhythm section legends gone in a little under a month. So sad. 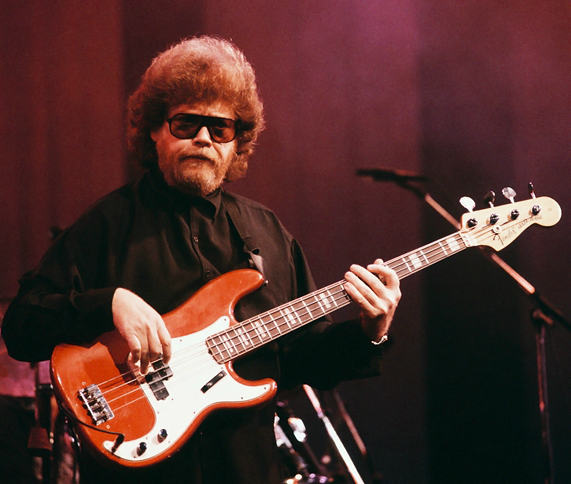 After having lost one of the greatest drummers in Rock & Roll history, Levon Helm, on April 19th, today I woke to find that Soul, R&B, and Rock & Roll bassist Donald ‘Duck’ Dunn has died at the age of 70. Duck Dunn epitomized the quiet groove master bass player, having served in that role in the house band at legendary Stax Records in Memphis, Tennessee for years. That house band, Booker T & The M.G.s, with members Booker T. Jones, Steve Cropper, Dunn, and Al Jackson, Jr., were the backing group on most Stax recordings from 1962 (Dunn joined in ’64) through 1970, including those by Otis Redding, Sam & Dave, Wilson Pickett, and Albert King, just to name a few. Duck would continue to record and play with Booker T & The M.G.s off and on throughout his life, and the list of other musicians with whom he recorded and toured is simply unbelievable: The Blues Brothers, Muddy Waters, Freddie King, Levon Helm, Neil Young, Jerry Lee Lewis, Eric Clapton, Tom Petty, Creedence Clearwater Revival, Guy Sebastian, Rod Stewart, Bob Dylan, Roy Buchanan and Arthur Conley. Back in March 2011, I wrote a post about the 60th birthday of the Fender Telecaster electric guitar, and in that post I included an old clip of Booker T & The M.G.s playing their biggest hit, Green Onions, and I just can’t think of a better video to include here in tribute to Duck Dunn. The bass line is one of the most recognizable ever recorded, and watching Duck you see a young man who is deeply locked into the groove, feeling it in every cell of his body and throwing it down. It’s a thing of stunning beauty! R.I.P. Duck Dunn, and thanks for all the incredible music.